The principle of “seven generations” comes to us from the Iroquois nation, where is considered to be the “Great Law of the Iroquois.” This principle said that each decision that was made needed to consider not just the immediate future but the 7th generation, those yet unborn. This principle has become closely tied with modern sustainability movements, where there is a growing understanding that for any society and ecosystem to endure, they must be treated in a way that nurtures and sustains, rather than pillages and depletes. This is a fairly radical idea to a Western culture, where concepts like manifest destiny and the relentless pursuit of growth that have driven westerners literally spent centuries pillaging the land, colonizing new places, driving out native peoples, stripping forests bare, and so forth. This idea of recirpocation is essentially foreign to most growing up in the shadows of that exploitative past. Land and ocean worth protecting! Of course, those living nature-based spiritual paths, like druidry, are struggling with the dissonance between this cultural path and finding a new relationship with nature. And so, going to connect with nature deeply, however, and we come from a cultural heritage where the kinds of behaviors I listed above are normalized, and where we benefit from them, whether or not we want to, then reciprocation becomes even more critical to understand and embrace. In the last few weeks, we’ve been delving deeply in to the different ways that druids and other earth-honoring individuals can connect with nature. We’ve looked at nature wisdom, how to learn about nature in various ways and nature engagement, where we can learn to use nature to build value and connection. We’ve also considered nature reverence last week. This week, we think about reciprocity, where we learn to give more than we take, and create a sustaining and regenerative relationship with the living earth. Inherent in the use of nature (which we discussed two weeks ago) and our dependency on nature is reciprocation. The term “sustainability” is the idea that what we take from the land still allows that land to be abundant and healthful, that the resources used will be able to replenish themselves in time (with or without human help). But, like many permaculture designers, I find that the term “sustainability” lacks the power of good and it doesn’t necessarily take the view that humans have taken too much. Here in the USA; white settlers to this land found it full of incredible richness and abundance–all the while omitting the people and practices that made that abundance happen–these lands were carefully tended Native American tribes for millenia. In a few short centuries, the old forests are gone, the extraordinarily productive food forests are no more, and many species are dwindling. It is for this reason that it isn’t enough to “sustain” what exists, but instead, give more than we take, help regenerate and heal, and do good on the land–all the work of reciprocation. I believe that this kind of work helps us achieve long-term health and balance of the land while also attending to our own needs–and ultimately, our own survival. This reciprocity has at least three areas. I honor the conservationists of the 19th and 20th century in the US as ancestors: each time I am able to visit wild lands, public lands, and national parks, I see the tireless work of their hands and hearts present in each stone placed upon the path, each tree that was protected and not felled, each natural wonder that is still present and public for me to witness. And so, one way to connect through nature and do the work of nature reciprocation is through conservation activities. Sanctuaries for Life. If you own land, you can work to create and maintain various sanctuaries. Organizations like the World Wildlife Federation and Monarch Watch, as well as possibly your State Extension program (if you live in the US) offer tools and information to help you establish wildlife sanctuaries, butterfly habitats, and so forth. I have found that doing this kind of work has several benefits: one, it is educational for you as you learn more about these practices; two, once you gain the signage, it is good information for neighbors and others who may be wondering why you are doing something obviously different with your land; three, it is excellent “awareness raising” for those same neighbors, who ask questions and want more information. Finally, it supports good organizations doing additional conservation work. Join a local organization and participate. 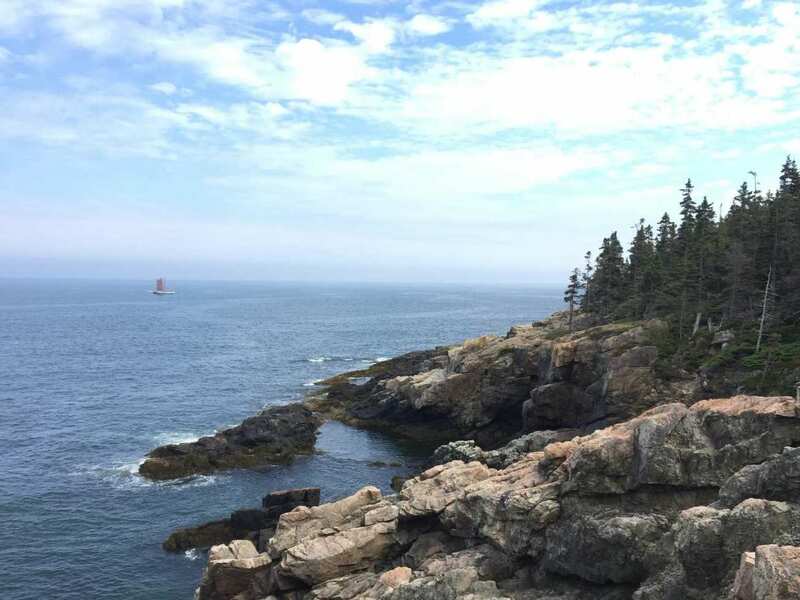 Nearly everywhere, local organizations are dedicated to helping conserve and preserve the natural ecosystem. Where I live, there is a lot of work being done on rivers, and one of the organizations I frequently donate to and assist is an organization called the Evergreen Conservancy, who has funded several large projects to clean up acid mine drainage from local rivers (including one that I now enjoy kayaking on). I love the work this organization is doing, it is local to my county, and I can easily get to know folks and participate. You can physically see the results in the clean flowing water. Learn about a species or two and focus your energy. Another way of thinking about conservation is to focus in on a few species, or one species, and learn about how to protect that species. I’m really interested in some of the species that United Plant Savers works with, particularly, Appalachian herbs that are so quickly disappearing from the ecosystem like American Ginseng, Black Cohosh, Blue Cohosh, Trilium, and more and I’ve been focusing my energy on those herbs. Attend Clean ups and other events: Often, communities, parks, and local organizations will arrange for various clean up activities–river cleanups, trail cleanups, tree plantings, removing invasive species, etc. They often need a lot of volunteers, so this is another way to engage in conservation. These activities are only some options–there are so many more out there! are about establishing and engaging in relationship; by working with healing any part of the land, you are working to reciprocate. Making and Scattering Seed balls: Scattering seeds of rare species (such as those on the United Plant Savers’ list) using seed balls, or planting species out in places where they are needed. This work requires quite a bit of knowledge (as you want to make sure you are planting native plants, not spreading ones that may cause harm). As part of this, I have developed a “refugia” garden that are designed to produce seeds and cuttings that I can then propagate elsewhere. Lawn Regeneration and Yardens: A second regeneration activity is working to create ecosystems in place of lawns. Lawns are often places of consumption; they offer little to wildlife or insect life. By converting some sections of lawns to various gardens (pollinator-friendly gardens, even with good eats) you can help develop more robust ecosystems for birds, wildlife and insects to thrive. 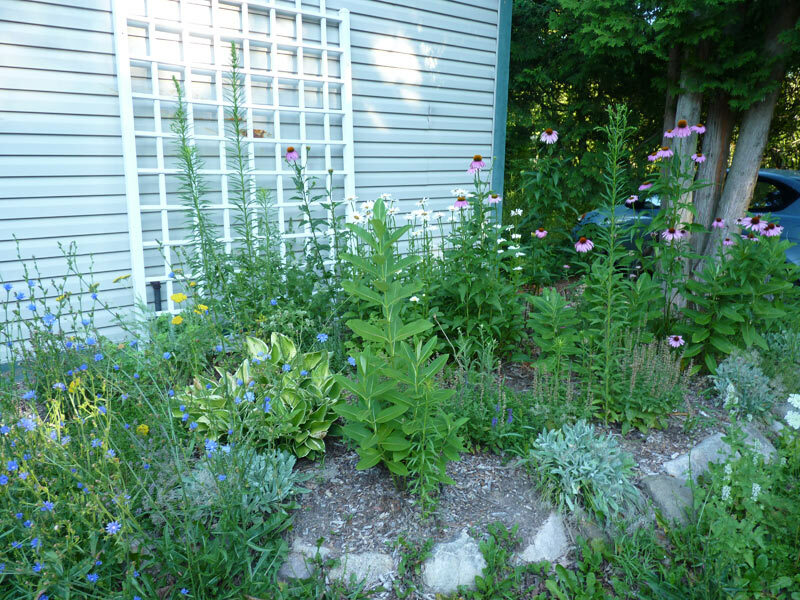 Here is an example of a larger site using permaculture principles (my former homestead in Michigan). Carbon Sequestration: Home-scale and community-based carbon sequestration This is something that is only beginning to be talked about. We already know that forests are one of the best carbon sinks–so planting trees and allowing trees to grow is one way to contribute. In Paradise Lot: Two Plant Geeks, 1/10th of an Acre, and the Making of an Edible Oasis in the City, Eric Toensmeier and Jonathan Bates describe their work with carbon sequestration – through composting initiatives and biochar, they calculated that in a few years, they had sunk about 400 lbs of carbon into their soil. Increasing soil fertility often increases the carbon in soil. Composting: A lot of active healing of the land focuses not only on planting things but on keeping the land we have healthy. Landfills are a serious problem, both in terms of land space and land use, but also in terms of what goes into them. By starting a composting pile or joining a composting initiative, you can divert some of your food waste and turn it into productive soil–that can then be used to convert lawns to gardens, grow tomatoes, and more! Larger Initiatives that regenerate and heal: There are a lot of larger initiatives that are worth considering–many of these would fall under “regenerative activities”. One that I’ve been interested in lately is stormwater runoff. Stormwater is a huge problem for most of the temperate places in the world that have roofs, parking lots, roads, etc. Most communities, counties, or states have laws that govern how stormwater must be handled before it goes into rivers and streams–but many of these laws are not upheld. By working in groups and as communities, we can install rain gardens, more friendly surfaces, living roofs, and other ways of protecting and keeping waterways clean from further damage. Using permaculture principles and practices, and using sound judgement, we can land to help heal damaged ecosystems and bring ecosystems back into health. I have primarily focused on the things you can do in the mundane/outer world in terms of healing and regeneration; next week, we’ll talk more about inner things you can do that also focus on reciprocation and blessing. I also want to note that if the above kinds of things appeal to you, consider studying permaculture design further–I found this to be one of the most empowering things I’ve ever done, and it really helped me shift my own mindset and know that I could be a force of good and make a difference in terms of healing the land. There are permaculture design certificate courses that you can take all over the world, including some totally free ones that can be done virtually. Throughout time, humans have recognized that rituals and ceremonies designed to offer something back, physically or metaphysically, was also part of reciprocity. Offerings in this case are symbolic representations of our understanding of the give and take relationship we have with the earth that provides abundance. In some cultures, failure to make such offerings had dire consequences for those who depended on nature for survival–famine, pestilence, and so on might occur. For other cultures, offerings were more symbolic in order to help facilitate a good harvest. And so, while first two areas with regards to nature reciprocation are things you can physically do, the final area is much more energetic and magical in nature–it is primarily a gesture of goodwill and honoring nature. There are lots of ways that we can build offerings into our practice as druids and nature-centered spiritual practitioners. Since the tradition doesn’t have a specific way of making an offering (as other traditions may), the choice of offering is very much up to you. I wrote more specifically about sustainable and meaningful offerings here, so I’ll only briefly summarize in this section and offer some suggestions. Offerings of physical things: The general principle here that I like to follow is this: my offering should be an offering of something that I value and that is important to me, not simply an empty gesture of something that I purchased. Many things that can be purchased are problematic because they put additional strain on the land (the resources that produced it, the shipping and fossil fuels, the packaging, etc). I believe it is better to either gather your offerings, make them, or grow them. They could be as simple as acorn caps that you have gathered in the fall and painted a symbol on (I used something like this for many years). I currently use a sacred offering blend that I grow myself; I posted a recipe on my blog for my sacred herbal offering blend this not too long ago. Offerings as Rituals: Offerings don’t just have to be physical things. Many offerings can also be ceremonial in nature; like a land blessing or healing ceremony. A wassail ceremony, for example, is an excellent example of a ceremony that enacts the principle of reciprocation, as are simple blessings and offerings of food, drink, etc. Offerings as Time/Life Energy: The above areas (conservation and regeneration) are also offerings–they are offerings of your time and life energy. If done with sacred intent and intentionality, I believe these are some of the best offerings you can make to the land and her spirits. Offerings of Creative Gifts: You can make an offering by playing music (which plants respond to), drumming, or dancing as well. These can be gifts offered to the land itself, or gifts shown to humans in honor of and inspired by nature. When it comes to offerings, I think that your intentions are what matters most–that you are genuine, that you have given the offering considerable thought, and that you offer something that is meaningful. As the Great Law of the Iroquois, the law of seven generations, suggests, reciprocation can be not only an activity for individuals, but also a cultural value, something that a group of people accept to be right and true. If the earth is sacred, we can treat her in a sacred manner that does not deplete her, and practice reciprocation in our interactions with her. To me, reciprocation is at the core of what nature spirituality can offer, what it can aspire to be, and what its potential is–creating life-sustaining and life-affirming values, people who live those values, and someday, perhaps, life-affirming and nurturing societies.